Home All Posts	Start Your Engines. Stickibox Craft Kit The Cardboard Car. Seeing Leo running around the lawn grasping a box that was increasingly getting covered in grass stains led me back down the dusty memories of childhood. I found myself hit with a feeling of nostalgia. I was once a master of the imaginary game, my sensory world when I was little being mud, water and trees. That said life is also for writing and art, imagination, dancing, singing, colours and nature. There is room for all in this rather pokey two bedroomed home. I am not always filled with grand creative ideas. I blame sleep deprivation. 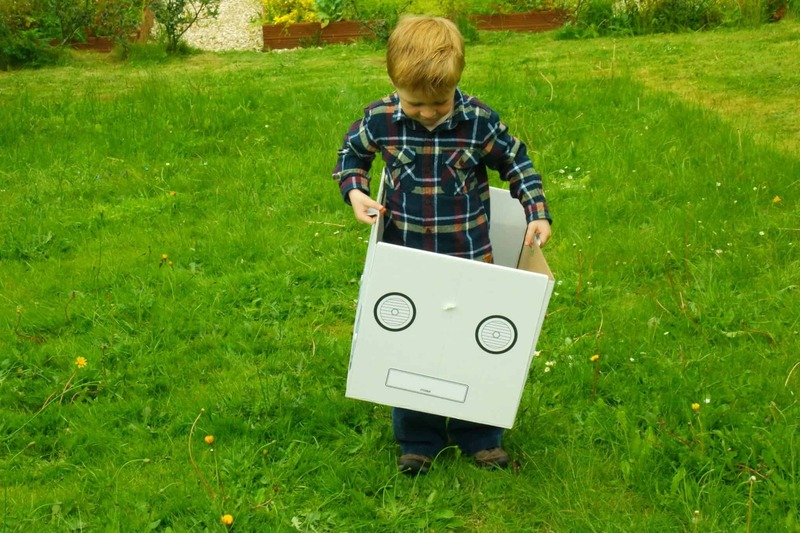 So when I was contacted by the lovely Kerry and Pip the co-founders of Stickibox craft kit I was excited and intrigued to see a product that encourages children to create their own personalised cardboard toys. A start-up company, they give children freedom to create their own car design; the inspiration came from watching their own children play. Our pack arrived and Leo tore the wrapping off! The external packaging is simple and attractive, you can tell it has been carefully considered. I immediately thought it would make a unique birthday present for what feels like 1000’s of Leo’s little friends that constantly are having parties. Inside the Stikibox (Stickers + Box) car pack is an instruction leaflet, sticker and wheel set and a box with a perforated base, handles and the ability to fold flat for easy storage. We built it together, Leo followed the instructions (great for problem solving) and was simple enough for him to construct himself (developing motor skills) with a bit of help from mummy so I didn’t have to get ‘flat pack sweary’. He kept giggling excitedly and loved putting the stickers on, poking his tongue out in concentration. The only thing we faltered on momentarily was to make the holes for the little rivets that mean the wheels can turn. I found a metal kebab stick perfect for making the hole. Do not give your kid a kebab stick. The Stickibox website also offers some fab ‘how to’ guides on how to decorate your car, i.e. campervan or batmobile. Leo went all ‘out of the box’ thinking and decided he loved it white. In earnest once the stickers were on, Leo was outside running, role playing, and racing round the garden. The daisies will never recover. Surprisingly for cardboard it stood up well to my 3 foot whirlwind of a son. He kept driving into a tree and telling me he was pretending to be mummy. For the record I have never drove into a tree. Also it’s cardboard if it rips, tape it up. Service point, check. I also love that it is 100% percent recyclable so when it’s time the car can got to the big green eco bin in the sky. The next night we took the car to a friends and the kids coloured it together. She loved it too. I think it would be great entertainment if you had hired a hall for a birthday party and all the little ones had a car to personalise. Grand Prix style. The excitement Leo got out of this, priceless. My partner did ask, why pay money for a box..so I gave valid consideration to this question as other people may wonder the same..the last time I had a Leo size box that we turned into a spaceship was when he was two and they delivered a chair, I couldn’t fold it away and got cross at it after two days. Also if you already have a box at home because you are super organised and keep them in the loft for 6 years like my Nan, then you can simply buy the Stickibox accessory pack. What you are paying for is high quality product that promotes creativity and active play and lots of ‘neooowmmm crashhhhh beeeeeep’ sounds; supporting small businesses and inventive hardworking mothers, made in the UK, from where possible recycled materials. As an extra incentive my readers can receive a 20% discount when they order from the website. Simply use code REVIEW20 on checkout. Note: We were very generously given the pack, which we feel honoured and grateful for. As always our opinions on the product are honest and our own.